It was a dark (but warm and not particularly stormy) morning off Honokowai Beach when Firefly crossed the finish line at 4:41 am HST. A welcome relief to Bob Strong and his crew after a challenging 14 days of racing. While Line Honours is clearly theirs to celebrate, the waiting game now starts to see how far behind Joy Ride (and potentially Kraken or Salient) will finish and who will be the Overall Winner. Firefly arrived in Lahaina to their waiting families, an official greeting party from Captain Jack's and a crowd of local wishers. After a few quick hugs, the champagne came out and the official hose down started. 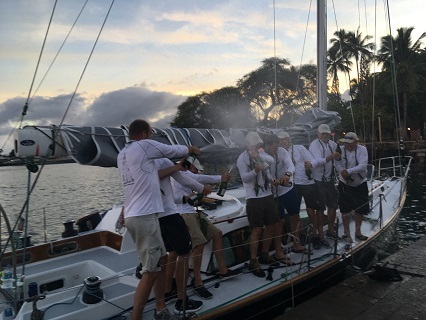 Now sticky from blowing bottles of fine bubbly over themselves, and very "funky" after 2 weeks without showers, the crew did everyone else a favour with a celebratory leap into Lahaina harbour before trotting up to the Pioneer Inn for mai tais and breakfast. Navigator Brad Baker, a 10 time Vic-Maui veteran, reported that this was his most difficult race to route by far. Not only was the weather very non-typical, the close racing with rival Joy Ride was all consuming. Skipper Bob Strong reported that after some trepidation after a few gear failures early in the race, the crew got more and more comfortable and pushed the boat very hard to the finish, and on one wave reported a boat speed of over 26 kts - astounding for a boat of this type. But two things really stuck out for both Bob and Brad - the very welcome visits by dolphins and birds, and the close camaraderie built among a crew of very diverse sailing backgrounds. After talking about the incredible amount of preparation, Bob did not give the typical answer when asked about returning in 2020 - he did NOT say "no bloody way".